The Great Lotion vs Oil Debate. – This Square Peg. The Great Lotion vs Oil Debate. August 19, 2015 August 19, 2015 Categories Beauty, Hilarity, Life, Momawesomeness, beauty1 Comment on The Great Lotion vs Oil Debate. Anyway, I’ve been a lotion lover since I can remember. Hands down, Suave lotion was my favorite since I was old enough to buy my own beauty products in Rite Aid; its soft feel and lovely scent usually made waking up in the mornings for school somewhat bearable. Somewhat. I experimented with all kinds, though, judging them based on how my both dry and sensitive skin reacted to them, and how my senses were ignited by their aroma. However, several years ago, I discovered Aveeno Lotion and I’ve been a one-lotion lady ever since. All that said, the idea of using body oils was a foreign concept to me. For one thing, I had images of slipping off seats and other surfaces because of being just super oily. Just no. And honestly, having had oily skin since puberty struck (oily T-Zones represent! ), the idea of introducing more oil onto my skin was no bueno. But things change, huh? It started when I watched one of my favorite YouTube personalities, Evelyn from the Internets, discuss her skincare essentials. (Watch that video here, and stay for the rest of her videos because she. is. pure. hilarity.) When she discussed using body oils, it intrigued me. Mainly because I, too, want my clavicle all shiny and such (again, watch the video and you’ll know what I’m referring to.) Hey: with weight loss comes evident clavicle bones. And I’ve always loved that part of my body. So, yep, there you have it: I now wanted to try body oils because I want a shiny clavicle. This Square Peg is all about transparency, don’t you know? 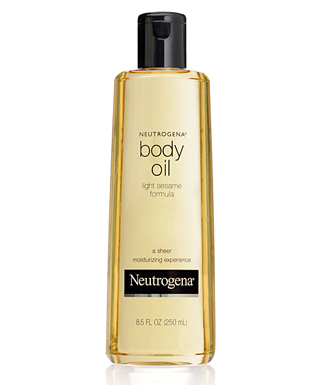 It just so happened, as I wondered which oil to experiment with a few days later, that my mother had a bottle of Neutrogena Body Oil in her room. Also a surprise, being that she has been the founder and CEO of using lotion since I could remember. Anyway, I asked her if she liked it. It’s ok, she replied. I only use a bit, though, here and there, along with my lotion. Banning my oft-repeated images of being so oiled up that I fall of chairs from my mind, I asked if I could use some. Take the whole thing, she said. And so, after a great workout last night and jumping into the shower, I decided to use the oil. Oh, powerful body oil gods, I just didn’t know. I didn’t know how so fresh and so clean clean I would feel. I didn’t know how that lovely aroma would make me smile in my sleep. I didn’t know just how the clavicle shine would delight my eyes. I feel refreshed. This morning, as I sit before this monitor, the aroma continues to cuddle my senses and I welcome it. The bottle promises a “sheer moisturizing experience”. This is true. Not only do I feel refreshed, but I feel moisturized, hydrated, not dry. The light sesame formula mentioned on the bottle holds true, as well. It’s not overwhelming, throat-clogging, and no, I haven’t yet fallen off any chairs because I’m all greased up. I will say that being light with the application helps, though. Anyway, I love this product. But I’m not bidding 1,000 goodbyes to lotion quite yet. Because ashiness lives, y’all. And since my feet and elbows hold PhDs in ash, and those two areas tend to be kind of tough, I decided to combine the lotion with the oil and applied both to those areas. Other than that, yeah, I’m officially a body oil believer. So, tell me, dears, are you a Lotion Lady or a Body Oil Babe? Pingback: Products from Heaven: It’s Shea, Baby, All Shea. [The Body Edition] | This Square Peg.